Burris Computer Forms® announces the addition of PrinTable ™ Place Cards and Tent Cards to its product line. PrinTable ™ Cards allow for customization and printing of each card by the user. The PrinTable ™ Place Cards come four to a sheet, are bright white durable cardstock, and are made from 30 percent recycled paper. 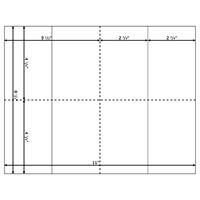 Each 8.5” x 11” sheet is divided into four cards measuring 4.25” x 5.5” when printing, 4.25” x 2.75” when folded for placement. They are available in multiples of 1,000 place cards (250 sheets). Print-on-demand place cards can be used for banquet, dinner party, luncheon, or wedding name cards. 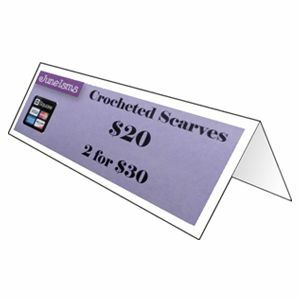 Other uses include gift tags and small signs for craft shows, point of purchase cards, and other everyday uses – printed or handwritten. PrinTable ™ Tent Cards are bright white durable cardstock, made with 30 percent recycled paper. They come two-per-page, separated by a micro-perforation for easy detaching. Each card is scored to assist with folding. They measure 8.5” x 5.5” when printing, 8.5” x 2.75” when folded for placement. They are available in multiples of 500 tent cards (250 sheets). Uses for PrinTable ™ Tent Cards include farmer’s market price and product labels, name cards in conferences, and product descriptions at trade shows. Print-on-demand place cards and tent cards allow customers the flexibility to print any quantity of their cards in-house at a given time. Users can tailor the words and images on the cards to align with their needs. 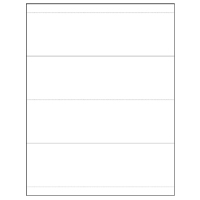 Many professionals, such as banquet or convention managers, event planners, exhibit sponsors, and meeting organizers may find these blank, printable cards useful for in-house printing of meeting, panelist, and attendee name cards. Wedding planners may find them useful for place settings; and retailers and trade show exhibitors, for product descriptions. The cards are compatible with inkjet and laser printers and copiers. Burris provides free templates for its PrinTable ™ Cards, downloadable from its website. Jerry Guzi, President of Burris Computer Forms®, gave the following statement. For further information about PrinTable ™ Place Cards, click here. For further information about PrinTable ™ Tent Cards, click here. For assistance or to request free samples, call 800-982-3676 (FORM) or email amy@pcforms.com. Burris Computer Forms® is a pioneer in the print-your-own industry, offering a wide selection of customizable printable products. Burris also offers Peel Out!® Shipping Label Sheets – a combination packing list and shipping label used to streamline order fulfillment. Burris now introduces its PrinTable ™ Card line, assisting customers by providing customizable blank place and tent cards. To learn more about Burris’ products, or to request free samples, visit www.pcforms.com. Headquartered in Roanoke, Virginia, Burris Computer Forms® was founded in 1992 and is privately owned. Its website, www.pcforms.com, contains a Do-It-Yourself Printing blog, free downloadable templates, how-to articles, and other online tools. Burris Computer Forms® is a registered trademark of Jerry Guzi & Company, a Virginia corporation.